He’s performed with and conducted some of the best orchestras in the world, and we’re lucky to say he’s made his home base in Elgin. Meet the dynamic leader of Elgin Symphony Orchestra and learn what it’s like to stand in the company of legends. Meet the leader of the Elgin Symphony Orchestra and learn about his musical interests and performance experiences. Andrew Grams has always been surrounded by music. Growing up, his parents constantly played classical music on the radio. At the age of 8, they introduced him to the violin, sparking a curiosity in and passion for the instrument that eventually would lead him to a successful music career. The Maryland native added conducting to his resume at age 17 when he directed the World Youth Symphony Orchestra in Michigan. In 1999, he received a bachelor’s of music in violin performance from Juilliard School in New York, and in 2003 he received a conducting degree from the Curtis Institute of Music in Philadelphia. Grams’ musical adventures would bring him to the Chicago suburbs a decade later when, after a two-year search that included more than 200 national and international candidates, Elgin Symphony Orchestra (ESO) named him as its new music director. His work was quickly noticed locally and around the state, as he received the Illinois Conductor of the Year award from the Illinois Council of Orchestras in 2015. 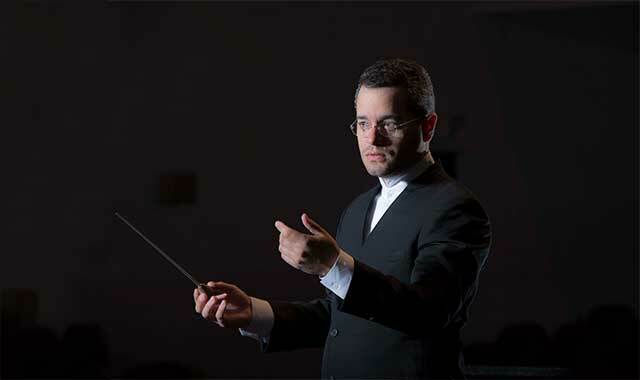 Today, Grams, 40, maintains a demanding schedule as he appears not only with Elgin’s orchestra but also as a guest conductor with orchestras around the world including the Orchestre National de France, Orchester der Beethovenhalle Bonn, and the Cincinnati, Dallas and Chicago Symphony orchestras. We sat down with him to learn about his musical interests, his performance experiences and the joys of appearing on some of the world’s greatest stages. How did you get involved with Elgin Symphony Orchestra? Elgin has always had a very, very strong reputation. When orchestra musicians come to the Chicagoland area, they hear about the Elgin Symphony Orchestra first as the premier regional orchestra. I was hired as a guest conductor for the first time back in 2008. We did a couple of concerts and I had a fun time. When my manager found out the ESO was looking for a music director, I threw my hat in the ring. I came back, we worked together again, liked the results and decided to “marry” each other, so to speak. Talk about your musical passions and interests. I’ve been interested in music ever since I was little. My parents always had the radio on in the house when I was growing up. At that time, we had a choice of three full-time classical music radio stations. That’s what they always had playing, so that’s what I heard growing up. Over the past 40 years, my love of music has thankfully broadened past only classical music. But I’ve always loved the sounds created by an orchestra. What do you do when you’re not preparing for a concert? Usually, I’m prepping for other concerts. In addition to conducting the ESO, I guest conduct all over the world. I’m only working in the Hemmens Cultural Center (ESO’s headquarters) about three months a year. The other 40 weeks I’m on the road conducting an average of two concerts a week. So, that’s about 80 to 100 concerts a year. What do you love most about your job as a conductor? I love traveling to different parts of the world. I’ve conducted all over North America. I’ve conducted in Brazil, New Zealand, Australia, Hong Kong, Japan and all over Europe. It’s fun to look at where I have been because of my job. And with the vast majority of the orchestras I’ve guest conducted, I’ve known at least one person in that orchestra from somewhere else in my life – from a camp, school, summer festival or another orchestra. I appreciate those connections more and more as I get older. Is there a performance that sticks out in your mind? Is there a venue or someone you’ve worked with that stands out? There are many, many standout experiences. In baseball, you have Wrigley Field, the old Yankee Stadium and these other venues that have historical meaning. Classical music has the same thing, like Carnegie Hall in New York. I remember the first time I played in an orchestra on stage at Carnegie Hall. That had a great deal of meaning to me. I played with the Cleveland Orchestra on tour at the Musikverein in Vienna, Austria. I’ve conducted at the Concertgebouw, which is the great famous hall in Amsterdam. All of these places have a lot of historical significance, the way that these great ballparks do. When you walk onto a stage in a place like Vienna, you go back hundreds of years and you think about the famous conductors, orchestras and soloists that you grow up hearing about. It’s gotten to the point where most times I’m not nervous anymore. When I do get nervous, it’s usually because I’m about to perform something I’ve never done before or I have to give a big presentation before performing. Then, I’ll get nervous. To deal with that, I remind myself that I’m a professional and I know how to do the job. Then I just go. It’s more nerve-racking anticipating something than actually doing it. What challenges have you faced as a conductor? The most challenging part of my job stems from my lack of control over the execution. I’m not the one making the music. The musicians of the orchestra are the ones making the music. They’re the ones who have to play the notes, the rhythms and dynamics, and they have to play together. That’s challenging because the outcome is up to the players making the sound. Once we get to the performance, I can’t talk to them anymore. I can show them with arms, hands and eyes, but at that point, I’m trying to inspire them to play their best. I have a picture in my brain of how I want it to go. But, I have to expect that 99.9 percent of the time, it’s not going to go exactly as I planned. What’s your instrument of choice? I was in third grade and strings were starting to get popular, so I wanted to do something like that. I wound up playing the violin, and that became the instrument I stuck with and studied for the next 20 or 25 years. I worked hard, became good enough to go professional, play in orchestras and make a living. I wanted to get into conducting because I was young and thought I could do better than some of the conductors I was playing for. After a series of very fortunate events, I found myself doing this for a living. My house has a basement and neighbors aren’t close by. I have these gigantic speakers and when I’m home alone, I’ll turn them up really loud. I’m probably ruining my hearing but sometimes, I just want to feel that vibration. What drives you? What keeps you going every day? I like what I do. I want to keep doing what I do and see how good I can get. Fortunately, in the realm of music, you can always get better. There’s no career apex in music.